Make fun of them it all you want, call it a "girlie" drink and "not really a martini" (which, of course, it's not), laugh at me BUT .... 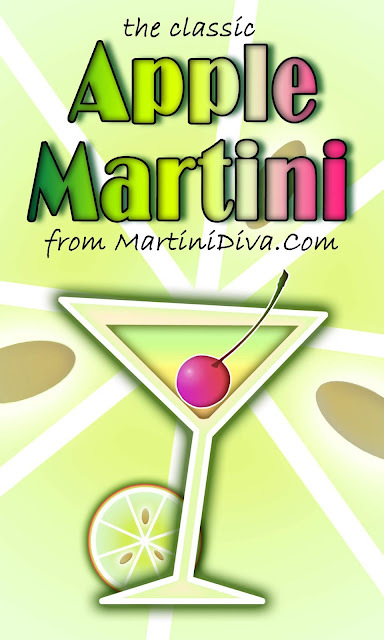 I LIKE APPLE MARTINIS! So there! You can play cocktail snob all you want and prattle on about "bespoke" cocktail recipes and the latest obscure liquor find you've tripped over but you can't take it away from me, I like Apple Martinis. They taste like the Sour Apple Jolly Rancher candy I loved as a kid but they have the added grown-up benefit of booze. As an adult I like being able to enjoy something I loved as a kid in a higher proof version. 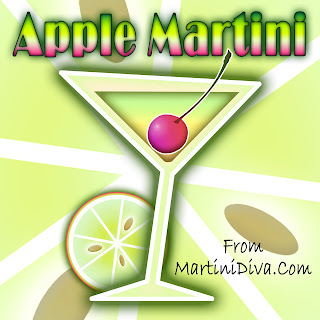 I always keep the ingredients stocked in my bar and make myself an Apple Martini every so often. It's great served with some onion crackers and smoked Gouda cheese. I believe happy hour is a personal experience, a ritual everyone observes in their own way. I don't believe any cocktail you enjoy drinking is "wrong" - even those made with my personal anathema, high-sugar and chemical laden cocktail mixes. If you like them, you're entitled to drink them (no matter how much crap they load into your body.) I believe in fresh ingredients, high quality ingredients and I try to share my philosophy with others so their cocktail hour is a heightened experience. (I even wrote a book about this whole happy hour attitude called The ZEN of COCKTAILS.) BUT I will not call you out if you just love a can of margarita, a bottle of pop wine or whatever you choose to drink. I might tease you a bit and try to cajole you into trying one of my own "bespoke" cocktails but I will not make you feel bad. That's just not zen, or cool. 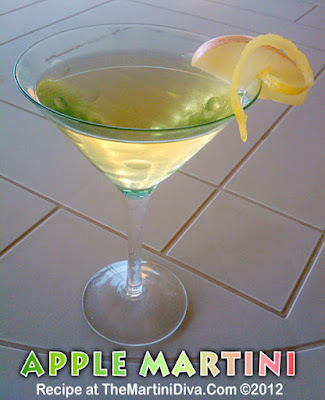 I've decided to re-post my Apple Martini recipe. It is my number two most popular recipe, second only to my classic Chocolate Martini and deserves to be back in the public eye. The only thing I've ever changed is the cherry. Instead of those awful grocery store Maraschino cherries I now only use my own homemade ones. THE APPLE MARTINI INGREDIENTS: 1 Ounce of Vodka 1 Ounce of Sour Apple Pucker 1 Ounce of Apple Juice Ice Garnish: One Slice of Green Apple, One Homemade Maraschino Cherry Tools: Cocktail Shaker Glass: Cocktail (aka Martini, yeah, you can gripe that I call a cocktail glass a martini glass too. I don't care what you think.) DIRECTIONS: Chill your glass in the freezer while you prepare your cocktail. Fill the cocktail shaker with ice then add the vodka, sour apple pucker and the apple juice. Shake until well chilled then strain into your cocktail glass. Serve and enjoy with defiance.